The primary goal of the new Prospect Meadows sports complex is to give every boy and girl in our community a chance to play ball. The Positive Sports Training youth baseball program heartily agrees and has scheduled at least 86 games at Prospect Meadows this season. Additional games could be added during the year. Positive Sports Training has been in existence for more than 30 years. There are 195 teams and approximately 2,500 boys in the program this season. The age groups run from 7-and-under through 14-and-under. The PST games will be played on Tuesday, Wednesday and Thursday nights at Prospect Meadows, which is located north of Marion at the juncture of Highway 13 and County Home Road. 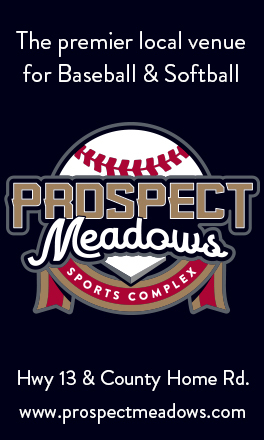 "We are very excited to see the number of teams aligned with Positive Sports Training coming out to Prospect Meadows to play this spring and summer," said Jack Roeder, the general manager of the sparkling new complex. "One of our main goals from Day 1 was to give a large number of local kids the opportunity to play at this beautiful new facility, and this starts the process." Tim Brecht loves baseball and fast-pitch softball, he greatly enjoys working with kids and he likes being involved with the community. He's found a perfect job that combines his passions at Prospect Meadows. Brecht, 57, has been hired to help with community relations and marketing at Prospect Meadows, which opens this spring. He'll be involved with camps, leagues, tournaments, classes and bringing as many kids and teams to Prospect Meadows as possible. He'll also be working to help expand the League of Dreams program, along with the Miracle League for people with disabilities. Brecht, who began working at Prospect Meadows about a month ago, did not realize the complex was so close to being ready with eight regulation diamonds and the Miracle Field. He'll be working with General Manager Jack Roeder, assistant GM Steve James and the Board of Directors to help make Prospect Meadows a big success. The Rotary Donor Wall is shaped like a giant map of Iowa. Its patriotic colors are red, white and blue. It's got stars and stripes, just like an American flag. And there are 600 replica baseballs for your name to be inscribed for all eternity. The only thing missing is a slice of apple pie. Prospect Meadows has begun a major radio advertising campaign to continue selling spots on the wall to individuals, families and companies who would like to become part of history by having their names placed on the new iconic structure. The ads will be airing locally on Cedar Rapids radio stations KHAK, WMT and KGYM as Prospect Meadows continues to raise money for the new baseball and softball complex that opens this spring. Tens of thousands of people will be coming to Prospect Meadows each year and one of the first things they'll see when they walk through the gate is the eye-catching Donor Wall. You can become a part of history at Prospect Meadows by having your name on that wall. At the same time, you'll be making a valuable contribution to the project. For $500, you can have your name on one of the 600 baseballs on the Rotary Donor Wall. And for $2,000, you can have your name on one of the stars on the unique structure. The local Kiwanis Clubs in Marion, Cedar Rapids and Hiawatha have embraced that motto right here in Linn County by pledging $300,000 for naming rights to the new Miracle Field at Prospect Meadows. The Miracle Field will give children and people of all ages with disabilities the opportunity to play baseball on a field that’s being built specifically for them, with a cushioned rubberized surface, wheelchair-accessible dugouts and a completely flat surface to eliminate barriers. Byron Tabor, a member of two local Kiwanis Clubs, is serving as president of the Kiwanis Miracle League at Prospect Meadows, and he’s delighted that his organization will have its name permanently attached to the Miracle Field, which will be the only one in our area. Tabor has seen people playing on the Miracle Field in Des Moines, a facility that has served as a model for the facility at Prospect Meadows. “It’s about helping the kids,” he said. "Once you see it happen, the absolute pure joy those kids have is joyous to see." The Miracle Field will be located just inside the entrance to Prospect Meadows in a prime location. Imagine baseball teams filled with Division I college prospects and future Major League draft picks coming to Linn County for premier tournaments and events. Imagine somebody like Manny Machado, who just agreed to a $300 million contract with the San Diego Padres, coming to town as a budding high school player with enormous talent. Steve James, the Assistant General Manager at Prospect Meadows, does not have to imagine players like that. He witnessed it first-hand during his years at Perfect Game USA, and he’ll be seeing the same thing now with Perfect Game staging a string of its top events at Prospect Meadows this year. Perfect Game plans to hold up to 16 events at Prospect Meadows in 2019 as the primary tenant at the new facility that’s being built just north of Marion at the juncture of Highway 13 and County Home Road. The grand opening is planned for this spring. The first tournament will be the Midwest Memorial Day Classic from May 24-27 and the schedule of events will run through October. The Memorial Day Classic is for 12U, 13U and 14U age groups, but there will be plenty of high school-level events as the calendar moves along. Perfect Game USA is considered the top amateur baseball scouting service in the country with its events all over the United States.